Branding your company is important. However, branding your company properly is imperative. If you are looking to start up your own company, or maybe you already have a company and you are looking for a fresh update, then the logo is where you need to start. Once you have your company name and business plan in order, it is important to get a good logo. If you have ever looked on certain websites to get a new business card, you will see they offer some generic logo options if you don't already have one. Do not fall for this trick! I can't stress enough how important a logo is. If you decide to pick a generic logo option, chances are someone else, or rather, a lot of people have that logo too! A logo helps differentiate you from your competition. Would you rather blend in? I hope your answer to that question is no! I love designing logos for my clients, and when I do, I make sure that I start with sending them a questionnaire. This helps me gain a solid understanding of what they are looking for. I ask questions about their company, who their competition is, who their target audience is, and what their logo is being used for (i.e. print or web). These are only a few of the questions involved in the process. If your designer isn't asking you these questions, then it's quite likely you will not be on the same page and the process will take much longer until you finally end up with something that you are happy with. Another topic surrounding logos is the cost. Some people don't want to spend money on a logo. They want something quick, easy and cheap! But that's not always best. When investing in your company, you also need to invest in your logo. Think about it... your logo goes on EVERYTHING! It is your brand. It is YOU. It goes on your packaging, your website, stationery, business card, watermarking, promotional materials, and more! When starting up your company you need to spend a little money to make a little money, and that includes your logo too! When thinking about your logo, you need to think about what you will be using it for. If it's going to be on packaging, then something simple may be a better way to go. Think about the top companies out there... they all have simple logos. Apple, McDonalds, Nike, Facebook, FedEx, and Coca Cola to name a few. They are all simple and easily recognizable. Now, that's not to say logos like this will work for everyone's company. Because, let's be real, they're not exactly pretty are they? But the simplicity and easy recognition is what has played such a large role in the success of these brands. Often people think more is better and they try and do as many colours as they can with as many different effects. It's important to note that when you want to print your logo for various reasons, often too many colours will not translate well. That's why it's always good to have a secondary logo option that is black and white, or just one solid colour. I use my logo in black and white throughout my packaging because often gold is easier to see on the web, rather than when you are printing. That is why it is good to have a logo that will also look good both ways. There is a lot more that I could say about logos, but I think this is a good place to start! I will be sure to write more about logos soon, and even share with you some of my own logo designs! If you're in need of a logo, and some of what I have said has resonated with you, please get in contact with me to start your own logo design process! I hope everyone had a great Monday! Typography is a HUGE part of the design world. Without good typography, you end up with a less than impressive finished product. Typography, aside from colour, is usually the first thing to grab peoples attention. The arrangement of type involves a few key things; such as: selecting your font, point size, line length, line-spacing, letter-spacing, and adjusting space within the letters. All of these have some fancy names that I learnt at school, but we will skip over the educational lesson today! Today is about pretty fonts! I am going to be sharing with you my current font favourites that are a must-have in my font library! Wherever I go, I make sure I have them installed in my various softwares because they have a huge impact on my design. When I was in school for graphic design, I always visited various font websites such as dafont, font squirrel, and lost type. While these are great resources for fonts, the only reason I was visiting them was because they were free! "Free" is music to a student's ears! Since completing my program and establishing my own brand, I have become more open to the idea of purchasing fonts. This may sound like a crazy idea when there are free fonts at our fingertips, but there is a reason that there are fonts available for purchase. They are designed by very talented people, who evidently need to make a living somehow, and the font packages are often equipped with more extras than the free fonts provide. These extras include things like ornamental lines, icons, and variations between thin, regular, semi-bold, bold, italic, inline, thin inline, dots... the list goes on!! When I first looked at some amazing fonts that were available for purchase, I merely laughed at the sight of the $80+ price tag for ONE font. But, I soon after discovered a website called design cuts. It's a resource that contains various design deals for a limited time at an insane discounted price! 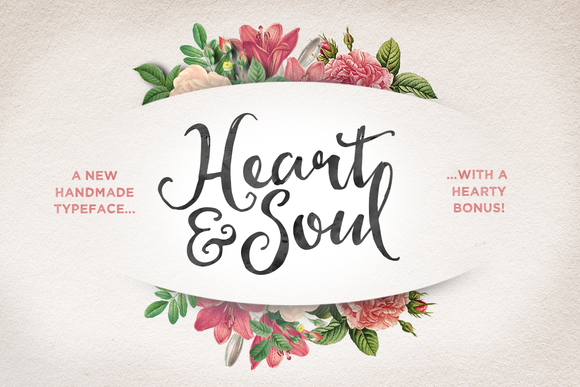 I have purchased two font packages through this site for $29 each which was a 90% off deal. The original price would have been over $300 (something I would never pay!!! ), and there were over 25 fonts in the package! Talk about a sweet deal! And here are two of my favourite FREE fonts!! So there you have it! Fonts are a big deal when you're designing, so it's important to choose the right ones, and also use good complimentary fonts. There's nothing worse than using two fonts in the same design that have no business being placed together! I'll be sure to post another blog that discusses which fonts pair well together.